The following provides information on good practise examples of sustainable construction in Village Halls and community buildings, as well as other relevant or similar types of building. Gale and Snowden are specialists in sustainable and ecological design, and also specialise in community buildings. Contact: 18 Market Square, Bideford, North Devon. Woolfardisworthy Sports and Community Hall, Devon (see drawings below). Inside: - a multifunctional sports and community hall, with a main hall for sports, large meetings, social events / functions such as wedding receptions, and small cinema / theatre with retractable seating for up to 140 people; gym / fitness room; snooker room; crèche / meeting room; multi-use bowls room; entrance foyer; stores; changing facilities. Outside: - external multi-use games area; safe area for children off the crèche / meeting room; external amphitheatre, with in-built stage and step seating; private garden area. Landscaping and windbreaks to reduce windchill. 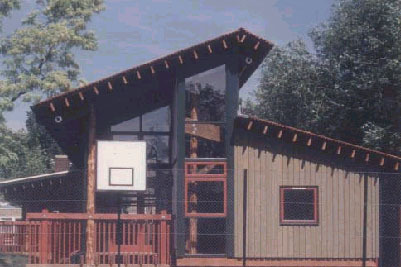 General Design and Materials: - oriented towards the south to benefit from passive solar gain; taking maximum advantage of natural lighting, backed up by high efficiency bulbs; super insulated roof, floors and walls; dense internal blockwork with timber frame construction externally, with green oak exterior boarding; internal fare faced blockwork for minimal maintenance, with concrete floor provides significant thermal mass; high performance, low emissivity triple glazed windows; maple floor for main hall, with wool, natural linoleum and clay tile floors for other rooms; natural slate roof; use of natural materials and avoidance of toxic paints, varnishes and stains; passive ventilation; water saving appliances and rainwater collection; designed for easy extendibility; landscape design, with planting, wildlife habitat and recycling pavilion. Rackenford Community Hall, Devon (see drawings below). A multifunctional village hall, with a meeting room, able to accommodate many diverse activities. Oriented towards the south-west to benefit from passive solar gain; taking maximum advantage of natural lighting, backed up by high efficiency bulbs; super insulated roof, floors and walls; timber frame and 'breathing wall' construction with untreated green oak exterior boarding; high performance, low emissivity triple glazed windows; timber floors for meeting and activity rooms, with natural linoleum kitchen and WC flooring; cedar roof shingles; use of natural materials and avoidance of toxic paints, varnishes and stains; passive ventilation; water saving appliances and rainwater collection; designed for easy extendibility; external cedar decking and sun terrace; landscape design, with planting, wildlife habitat and recycling pavilion. The Genesis Project: Multi Facility Renovation, Great Torrington, Devon. The Genesis Project is a community-based project which aims to help revitalise the centre of the town of Great Torrington, in North Devon. As part of this project, the site of the multi-storied old Castle Hill Hotel has been renovated to include a variety of community facilities. The project has been funded by various bodies including English Partnerships, Torridge District Council and LEADER. The project involved the restoration of a derelict Grade II Regency period Listed Building, and two more modern buildings linked to it. Phase 1 of the Genesis project includes a Civil War Museum highlighting Torrington's history, together with a shop and a telecentre. Phase 2 incorporated a public library, which moved to the Castle Hill Centre from its current location in Torrington, together with a tourist information centre and general purpose communal office space. Woolfardisworthy Sports and Community Hall - a best practise example of sustainable design. Architects: Gale & Snowden, Bideford, north Devon. Above: Woolfardisworthy Sports and Community Hall - plan. Above: Rackenford Village Hall: Architects Gale & Snowden, Bideford, Devon. Above: Elevation, Plan and Perspective for Lynton Learning 2000, Library and Telecentre, at Lynton north Devon. Architects: Gale and Snowden, Bideford, north Devon. Lynton 2000: Listed Building Conversion - Lynton, north Devon (drawings above). This project involves the conversion of Lynton's former Market Hall and Fire Station into the Local Authority's library and computer training centre. Built in 1908 the two buildings are attractively detailed in rubble construction with stone lintels, quoins window and door reveals. This is an excellent example of a redundant building being given a new lease of life. The need to conserve and renovate the historic parts of the building has been successfully married with the requirements of a contemporary library and computer training centre. Wincanton Healthy Living Centre, contact: Veronica Vickery 01963 31842 - one of Britain's first National Lottery Funded Healthy Living Centres - this is in the design and first phase stage, and involves an ecological conversion and extension of a redundant community hospital to a multi-use community centre - project architects: Gale & Snowden, Bideford, north Devon. 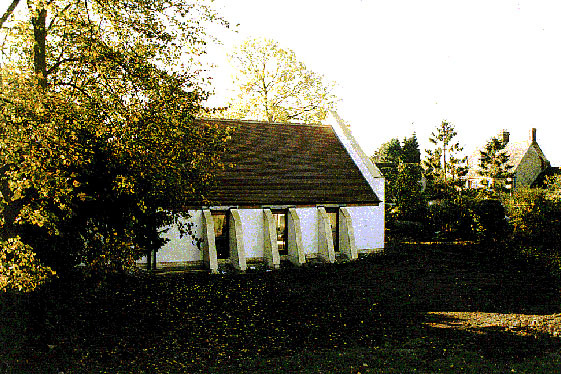 From research in 1995, a number of community needs were identified including the provision of a new community building in Bruton. The project will create a small community building providing facilities for a pre-school playgroup, an after school club and other associated activities. The total size of the building will be approximately100m2. The main purpose of the hall is as a base for the Community Kids Playgroup. The hall will cater for a maximum of 26 pre-school children, and be designed to keep running costs to an absolute minimum by the use of energy efficient services, hard wearing, long life, low maintenance materials, and maximising the use of natural light and solar gain. The building will be funded by a number of partners and we anticipate the total cost to be between £70,000 - £100,000. The project should start on site in October 2000. Regular meetings will be held between the architect and a steering group comprising South Somerset District Council, Bruton Town Council and the Community Kids Playgroup as the project develops. Fivehead Village Hall (nr Langport): ecological architects commissioned. Contact: Fivehead Village Hall Committee, via Community Council of Somerset. Norton-sub-Hamdon Village Hall (nr. Yeovil): ecological architect expected to be appointed during autumn 2000. Contact: Norton-sub-Hamdon Village Hall Committee, via Community Council of Somerset. Above: Environmental Education Centre, Tottenham, London. London Wildlife Trust Building, by Architype. The Calthorpe Project, by Architype. Under fives building and Community Centre. The Making Place, by Architype. Educational building with Royal Borough of Kensington and Chelsea. Conservation Education Research Centre, Bristol Zoo - by Quattro Design, contact: Hugh Nettlefield (0117 929 9672). Featuring low embodied energy, high levels of insulation, high thermal mass, natural ventilation, designed for maximum re-usability of materials, with energy efficient heating and lighting. Significant use of stone from redundant building; sensitive to its Conservation Area setting whilst also making a powerful sustainable design statement. Total build cost: under £700,600 (budget limit: £730,000). Selworthy Village Hall: this project is still in the early stages, however the Village Hall Committee (Selworthy and Minehead Without Parish) have specified the requirement for a good practise example of sustainable design for this building, suitable to the location within Exmoor National Park. Log Buildings designed and project managed by Dan Franklin (01837 851559 / 07970 969856): a Visitors Pavillion at Exeter Showground, and woodland classroom near Honiton for the Forestry Commission. Walter Segal style buildings have been widely used for community buildings; they are affordable and have won many awards for ecological design Segal buildings can be constructed as community self-build projects to reduce building costs, or using contractors - or as a mixture of self-build and contractors. The Green House, Bedminster, Bristol: headquarters of the National Federation of City Farms and Community Gardens. The GreenHouse building was purpose built for the NFCF. It is timber framed, with a grass roof. The grass roof not only improves the building's visual appeal in an urbanscape and provides insulation, but also offers a new habitat for bees, butterflies and birds. It also helps to cleanse the air of pollutants. North Moor Village Hall, Oxfordshire (see photos): a best practice example of solar energy generation within community buildings. Significant use of solar photo-voltaic panels, combined with energy efficient design means that this building is in effect a mini-power station, generating significant renewable energy and exporting its surplus to the national grid. Contact Alistair Binney, architect 01865 554558 (BRE approved 'Towards Greener Buildings' Design Advice consultant). The Westwood Centre, North Leach, Glos: For information contact Gloucestershire Rural Community Council on 01452 528491 and speak to the Village Halls adviser. 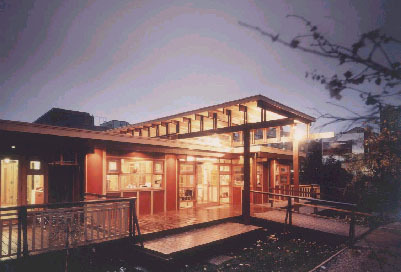 Educational Building for the London Wildlife Trust, Peckham, London. See above under Walter Segal Self Build Trust projects. A building that demonstrates the benefits to both people & nature of ecological building, constructed on a tiny budget. The Calthorpe Project, London. An Under Fives and Community Building which provides accommodation for the various activities of a lively inner city community garden. The building is 260 sq metres in size, with the various rooms grouped around a generous top lit circulation space. It was designed closely with the members of the project using 3-D computer simulations. The extensive verandahs and a 'green' roof of grasses, wildflowers, herbs and mosses integrate the building into the gardens. The building is finished with organic paints and stains, natural cork tiles and linoleum, to create a healthy and pleasant internal environment. 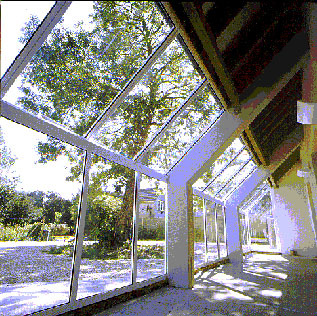 Northmoor Village Hall, Oxfordshire, designed by Design Advice approved architect Alistair Binney. The Making Place, London: a pioneering initiative to provide resources, support and specialist teaching of science and technology for children from primary schools throughout the Royal Borough of Kensington and Chelsea. The building demonstrates the 'greening' of technology providing a rich and stimulating teaching resource. Built from natural materials and passively ventilated it is designed to minimise its environmental impact and create a healthy internal environment. Home grown timber is used for the structure and cladding. The exposed structural frame, of beams and tree trunk columns, demonstrates to the children simple structural principles. The building fabric is insulated with recycled newspaper insulation and is designed to breathe. All paints and stains are non-toxic and floor finishes are home grown oak and natural linoleum. The roof finish is of cedar shingles and grass. The Making Place contains 2 classrooms, a large workshop, exhibition space, staff room and a disabled toilet, and cost £240,000 to build. For more information about how to ensure your village hall or community building becomes a good practice example of sustainable construction why not find out about ordering STSD's Guide to Sustainable Construction for Village Halls and Community Buildings.